Using a laser beam both for scanning and projecting images, researchers from the University of Tokyo (where the cookies paper also comes from) gained several advantages over the usual projector+camera setup. Mainly, they eliminated the need to calibrate between the camera and projector, and gained the ability to scan 3d objects without stereoscopic cameras. This work by researchers of Kyushu University uses QR codes in order to fix the user position in the world. It shows you the problem with academic conferences. By the time your papers gets published, some company may already deploy similar technology in the real world, as Metaio did with Junaio. QR-code calibration for mobile augmented reality applications: linking a unique physical location to the digital world. Nikolaos, Kiyoshi. SIGGRAPH 2010. SIGGRAPH, the world's most important conference on computer graphics and a pixel-fetishist wonderland is being held this week in Los Angeles, featuring several interesting papers on augmented reality. One of them explores the augmentation of cookies. Yes, we have all seen cookies marked with augmented reality markers. Games Alfresco has mentioned such cookies back in 2008. So how come such a paper got accepted into SIGGRAPH? Well, the simple answer is that you've haven't seen (or rather tasted) such cookies before. Created by researchers at the University of Tokyo, Meta Cookie combines together a head up visual display and head up olfactory display to trick your senses. I'm not quite sure what was the goal of that research, but were successful in changing how the cookie tasted. Probably some smart marketer will find a way to sell it as a weight loss device. You just need a way to print a marker on broccoli to make it tastes (and look like) ice cream (with a crunchy texture). Meta Cookie. Narumi, Kajinami, Tanikawa, Hirose. SIGGRAPH 2010. A very fine piece on Adbusters, debating whether augmented reality gives us a false sense of activism while we actually succumb to the cruelty of reality. Facebook my be working on mobile augmented reality features (which is probably only going to be a tiny part of their location based services). You don't need to be a programmer to create a layer for Layar. Hoppala brings layer creation to the masses. JC Penney & Seventeen Magazine tap metaio to create back to school AR app. I've never quite understood why would anyone play a 3d version of Tetris, but if you enjoy such an activity, you may want to augment it a bit. If you are a CS graduate you may have encountered ACM. Usually they put their articles behind a pay-wall, but not this one - Mainstreaming augmented reality. Video of the week is of a new AR game just released for the iPhone, Android, Symbian operating system (yes, such a thing exist), called AR! Pirates. Created by Optricks Media, best known for those augmented Bamzookis, the game play is not much more sophisticated than ye olde paratrooper game, but heck, it's probably your best option to drown pirate ships with your phone. It costs £0.99, and you can read more about it on Augmented Planet. Weekly Linkfest - Attack of the Vision Based Apps! This week will go down in history as the week vision-based AR mobile applications made their first move on the iPhone platform, and you'll find plenty of those in the linkfest. Is this the (very welcomed) end for webcam based AR? Junaio is the first of the browser to adopt any real time image processing, but it still limited to a tech demo, showing a superhero figure over a specific marker-image. Ben&Jerry's though had gone full-monty and lets you see augmented version of their ice cream tubs (see video below) via their Moo Vision app. Created by Circ.us and Patched Reality, it's unfortunately only available in the US appstore so I'm unable to try it out. However, I was able to try out ARSoccer but was fairly disappointed. This one, and a very similar minded Upsies (not yet available) let you kick a virtual ball. That's assuming you have white floor and dark trousers. I actually enjoyed it more to bounce the ball off random furniture, but it still not worth the buck. And finally, if you are a big football fan, maybe virtually face painting your face with your nation's flag is something you'll pay 99 cents for. ReadWriteWeb has an interesting piece on that "the leak in your home town" app, that adds a virtual oil spill to any BP logo - Are we entering the age of augmented trademark infringement? The 8th International Symposium on Ubiquitous Virtual Reality (ISUVR 2010) was held this week, Wonwoo Lee of the Mobile Augmented Reality blog reported live. As promised, here's Ben&Jerry's Moo Vision. Looking cool, but what's that thing about chickens being in my ice cream? I want my ice cream to be poultry free, if you don't mind! Maarten Lens-FitzGerald, one of Layar's founders and current general manager was kind enough to answer some of my questions in the following short interview. Many thanks to Claire Boonstra for giving a helping hand as well. I hope that in the coming months I'll get to interview other entrepreneurs in the industry. Can you shed light on how Layar came to be? What was SPRXMobile and how did you decide to create Layar? Back in 2007, we (Raimo van der Klein, Maarten Lens-FitzGerald and Claire Boonstra) were part of the founding team of Mobile Monday Amsterdam. We started this initiative to connect people who shared their enthusiasm for mobile technological innovation. Mobile Monday Amsterdam flourished and in 2008 we decided to set up a business together, launching SPRXMobile. The focus was on innovative mobile consulting: helping organizations discover and put the new world of mobile to good use. Several successful projects were completed for leading companies. Working for other companies was enjoyable, however, working on your own projects is even better! There were several ideas that we worked on in the early part of 2009. One of the projects was called Layar.... 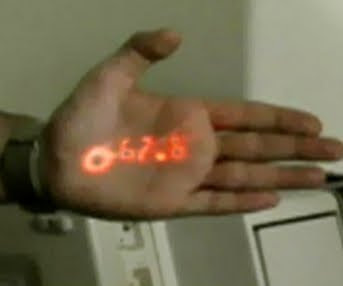 It was kick-started by the launch of the compass enabled Android devices, the blog post "the Augmented Reality Hype Cycle" and inspired by Vernor Vinge's Rainbows End & the Japanese anime series Denno Coil. The core idea was the offering of content in separate layers on top of reality. The launch of Layar on June 16th 2009 was very exciting as it was the first time we introduced our 'baby' to the word. When the media hype began it was unbelievable! We knew augmented reality was about to take off, but we hadn't expected to be in the middle of the feeding frenzy. It's such a kick to see your own product in the same blogs and magazines you have been reading for a long time (Wired, Engadget, Fast Company etc). And all were enthusiastic. It was the start of a great year! What was the most exciting moment, professionally, for you in the last year? Was there a moment in the last year when you said to yourself "we've made it"? The first most exciting moment was during the Layar Next event in late summer of 2009. I was standing next to the stage and listening to SF author Bruce Sterling give his "At the Dawn of the Augmented Reality Industry" talk . During the talk he began to rant about what was to come for the Augmented Reality Industry. We hadn't briefed him at all and just asked him to share whatever he felt like sharing. It was amazing to see how well he was able to catch the gist of the up and coming industry and predict its future. The second most exciting moment was when I arrived at our new office for the first time on the first working day of this year. It was early morning and no one had arrived yet. The team had moved into the new place while I was on vacation, so I hadn't experience the place 'occupied'. The old office was just one room and now we had moved up into this nicely designed and big professional office space. Such a clear step forward. The third exciting moment was the talk we did at Google Zeitgeist in front of leading CEO's of the world including the inventor of the world wide web Tim Berners Lee. He not only listened but at the end of the talk also asked some great questions including giving some great advice. It is very humbling to get advice from the very the man who made your work possible. The last most exciting moment was during my last trip to the US for the Augmented Reality Event. The second day I slipped out to go shopping at the big mall in San Jose. In the mall I went to different shops and booths from Sprint, Verizon and T-mobile and casually started talking with the sales people to see if they knew Layar without revealing that I was from the company. Not only did they all know about Layar, but they were also quite enthusiastic about it! I hadn't expected such wide spread brand awareness. There were lots of exciting moments, these were mine and I bet Claire and Raimo will have others. From the opening of the platform, launching the iPhone version, to reaching the 1,000,000 user mark or the 3,000 developer and the 1,000 layer mark. Or the global distribution deals with Samsung and others. All are good and many more to come. We haven't made it yet, we've only just begun. Even though Layar wasn't the first to the market, the press seemed to be infatuated with it since day one (for example, http://techcrunch.com/2009/06/21/layars-augmented-reality-browser-literally-more-than-meets-the-eye/) , and had reported extensively about new version releases throughout the past year. How did you achieve such a feat? Can you reveal some of your trade secrets for the budding AR entrepreneurs out there? We were lucky that the press picked Layar up. Looking back we know the first Layar video really made a difference. It captured the concept of augmented reality in the right way and helped people understand what augmented reality is and how it can be used. It was a great start. For the rest of the year we had four principles that worked for us: sense, scale, open and pull. Sense means that we don't always understand everything but trust that on a deeper level we know what direction to take. The mobile industry moves swiftly and is very complex. We trust our instincts most of the time and are not the types for elaborate business planning. It's no coincidence we are in the sensing business. Scale means that we create systems that can grow. Augmented Reality is an economy of abundance. There is no limit. We host in the cloud, limitless scalability as the Lakers - Celtics effect showed us. We also don't know what is relevant in Argentina or Tokyo. That's why we don't do content. Others make it, and make a good business when they sell their layer work and AR. We can't talk to everyone to make a business. But together with the developers and publishers we can. And another one is that we knew the Layer catalog wouldn't scale for the many, many layers and their content. You need a discovery mechanism to open up the augmented world. Like the EPG for TV, Google for the web etc. That's why we launched Stream. Open means that we share and give away as much as we can. The internet has great examples of openness like the protocols, websites like Wikipedia and software like Apache. This helps us see that to scale we need to be open. To last we need to be open, to give away and share the opportunity. We love the idea of infrastructure and its ideals. AR needs infrastructure and hopefully Layar can help by being open as much as we can. Pull means that we don't push. We don't call people and try to sell our product. We don't do anything that costs too much time and energy. We'd rather put the energy in a great product that attracts, that pulls everyone to us. Instead of spending money and a big marketing campaign we'd rather create a great feature that everyone will talk about and can be introduced with one blog post. John Hagel was a good inspiration for us for this. For us this works, they are principles we work by and that are closely linked together. What's next for Layar? Where do you see Layar a year from now? We have built a foundation for Layar these last months. A foundation with the Catalog, Stream and Floaticons. The catalog for all the developers to make great AR services and experiences and to build a business. Stream for the users to find what is fun and relevant. And floaticons for all to express themselves. The coming year we will be growing this foundation and adding things like image recognition and more. Finally, are you considering Google as a friend or a foe? Is Google Goggles a threat to the young industry? Google is neither at the moment, neither friend nor foe. They are a great service, we use them for mail and other services. And Goggles is a great product. Currently they are not a threat. Yes they do some compass AR in Goggles but that is automated search results. No developer built interactive & immersive AR experiences. Their image recognition is really fast and smart. This is good, it will be a great benchmark when we add that feature. What we see is that Google doesn't focus on the experience part of AR. They see it as a search interface. This all can change of course, but we don't want to worry about things that aren't there. 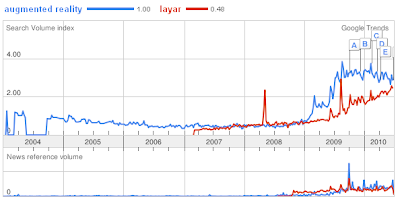 * True, the graph above is misleading - a substantial amount of Layar's search volume is composed of Indonesians looking for something completely different. 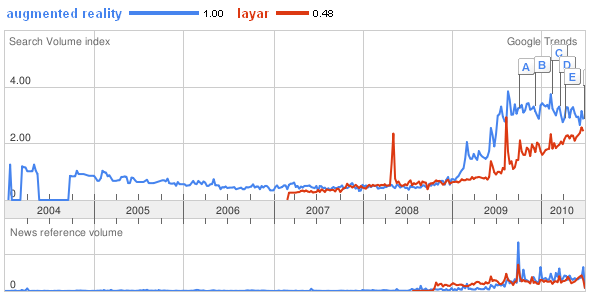 Yet, the peak in 2009 and steady rise since than can only be explained by the popularity of Layar. Other companies don't enjoy the same growth in search volumes, which lacking download numbers, is our best estimate of popularity. Top headline of the week obviously goes to Qualcomm, which will launch a free vision based AR framework for Android this fall. In order to encourage developers to use their SDK, Qualcomm holds a contest for best use of the framework, first prize is $125000. I have to get myself an Android phone and start working on that AR Farmville concept! Who's with me? int13 (missed you guys!) brings very smooth marker based augmented reality to the feeble Nintendo DSi. They're also submitting AR games to Samsung's Bada store. Layar now used as an art canvas in an interesting project with a Dutch museum. Yes, you can even market cancer using augmented reality. Happy 4th of July to our American visitors! This is a guest post written by Brian Patterson, consultant at Exhibit Edge, a trade show consultation and exhibit company serving the Maryland, Virginia, DC areas and beyond. Read on to find out how augmented reality helped Exhibit Edge's clients to attract more audience to their booth than ever before. Since the beginning of the human race, customers and dealers have gathered in commonplaces to buy and sell their wares. In the most modern form of these gatherings, trade shows, you can now witness spectacles where elaborate product launches are the norm, zany inventions make the news, and buyers and customers still connect to make deals. I’ve been working in the trade show industry for many years now, but I recently worked with a new tool that I think could change the overall trade show experience more than anything I can recall. If you’ve ever experienced a trade show floor, you know how exciting, crazy, and informational they can be. Generally the doors burst open and you wander around aimlessly, stopping by booths here-and-there on a whim. With Junaio, however, this experience becomes interactive, streamlined, and organized without losing that same invigorating feeling that comes with the excitement of the floor. Junaio provides visitors to the trade show floor with a map, interactive directions, and embeddable content that allows event organizers and exhibitors to really provide some context and organization to the floor. Finding specific booths, categories of booths, and general information with just a click is easy. And, for exhibitors, instead of printing large amounts of collateral, you can now ‘go green’ and allow users to scan your code in to download all of your digital media. Product demonstrations can also be greatly enhanced thanks to the downloadable app. Users can navigate to a booth using Junaio to guide them, and then watch a product literally come to life through the browser. In the demo you saw some Lego marketing managers showing how they built a virtual product demonstration that can be viewed on a monitor in their exhibit or via a booth visitor’s phone. Over the years we’ve seen numerous different ways to demonstrate a product, from live demo’s at the center of the floor to outdoor demo’s where a booth will literally call exhibitors out of the hall…. But using augmented reality to demo a product on a trade show floor is the most effective method we’ve seen for catching people’s attention. Based on our tracking, we found that the client we worked with who used this virtual demo received 2.5x’s the foot traffic that their exhibit normally receives. So, although it may take some time and investment to implement AR in an effective way, a strong ROI can certainly be realized by the sheer amount of people that are brought into the exhibit by their curiosity. I’m very interested to see other companies jump into the AR + trade show space, as that will push everyone to innovate further. As that innovation occurs, everyone benefits from better exhibits and more organized events. At Exhibit Edge, we pride ourseleves in giving unparalleled service offerings in the trade show exhibit industry, from banner stands to rental exhibits. Augmented reality is the biggest change I’ve ever seen to how a trade show is run, a paradigm shift if you will, and I’m glad we have a front row ticket to watch it evolve and grow.